I’m really happy with this finish. I’ve done several TWs but honesty didn’t think I would do another until I was talking with Will about his Masters degree in Religion. He basically studied ALL of them and I asked him if there was one that was his favorite (he is a multi-faith reverend). When he said Egyptian mythology, an idea was born! 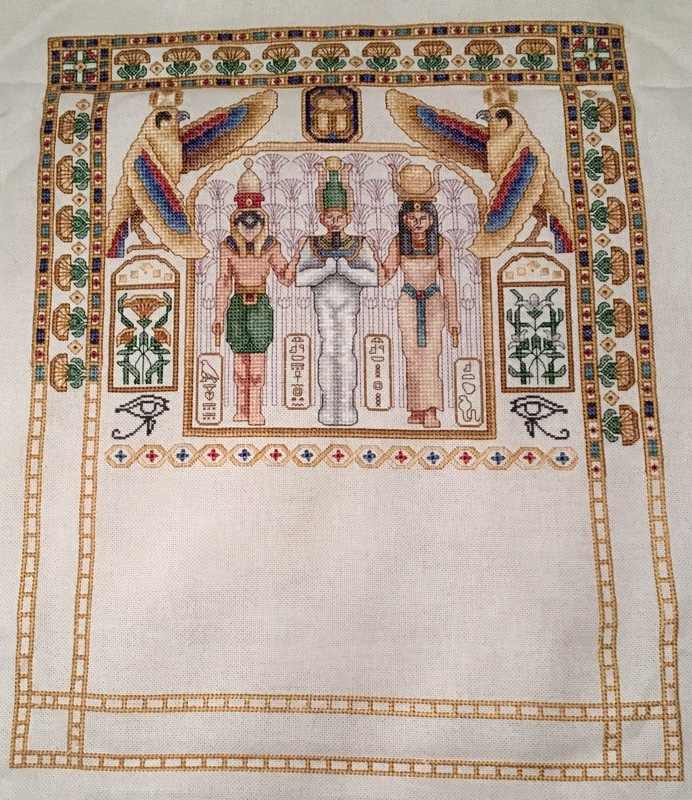 I knew of Teresa Wentzler’s Egyptian Sampler and I knew that I would stitch it for him. That was 2.5 years ago and its finally done! I’ve found some errors in this, but I’m choosing to consider them “unintentional personalization.” I had trouble tacking the rays down and keeping them straight.. but considering that I spent about 8 hours fiddling with them, they are as good as they are going to get! This hasn’t been washed yet. My giant tub of orvus was tossed when I moved and had to order some that should be here early next week. I’ve found a local framer and picked out where this will hang in our home… right above his statues of Anubis and Wapawhets and other Egyptian objects. TWs are certainly a lot of work and of all of them that I’ve stitched (non fantasy and no dragons) this is quickly turning into my favorite! Now… what to stitch next? I’ve got some ideas, but whatever I pick up will be smaller and less complicated!! 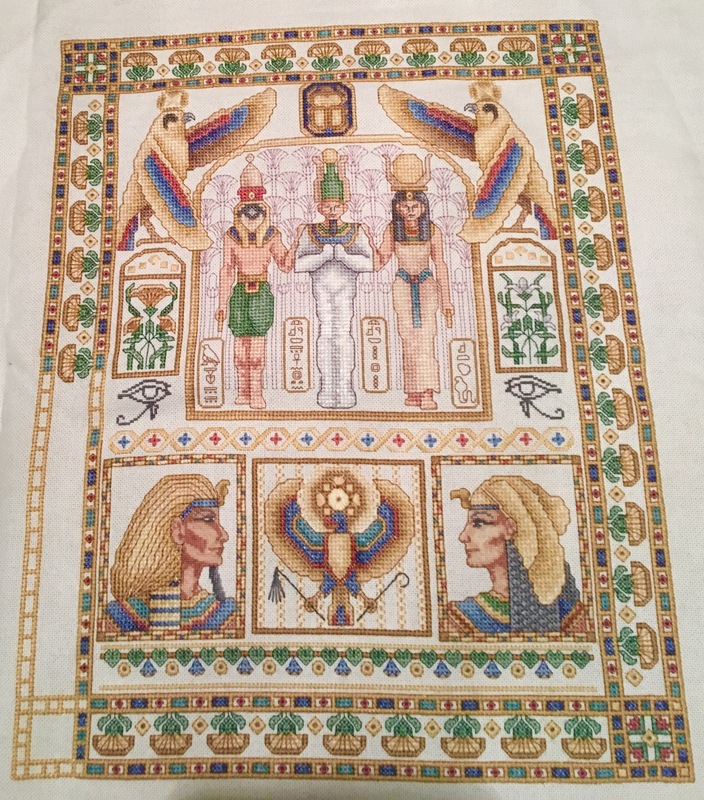 Here is my latest progress on Egyptian Sampler! I feel like I can say it’s almost finished!!! 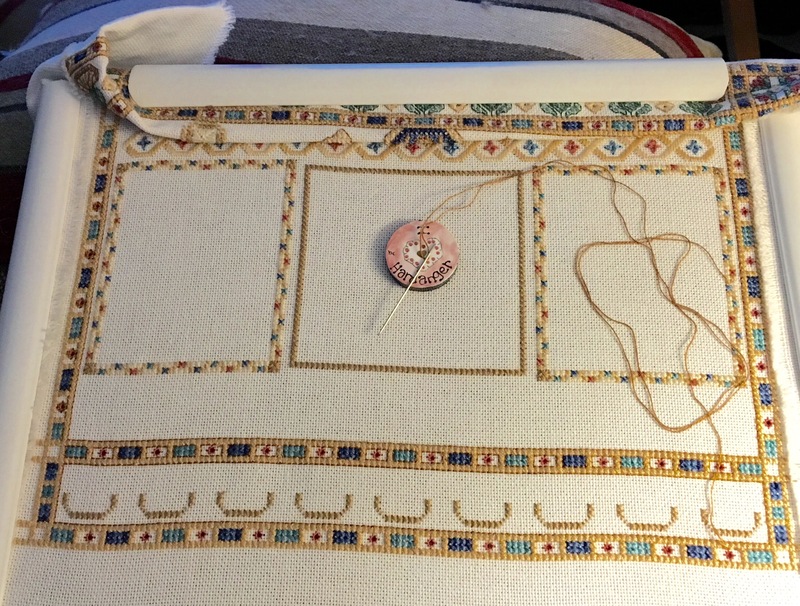 Since this picture was taken, I’ve stitched the color block border and the corner block and am just backstitching those before I finish the papyrus in the center part of the border. Most of my stitching is done over the weekends, but with the advent of spring, we’ve been busy doing Expos to support my husband’s business. 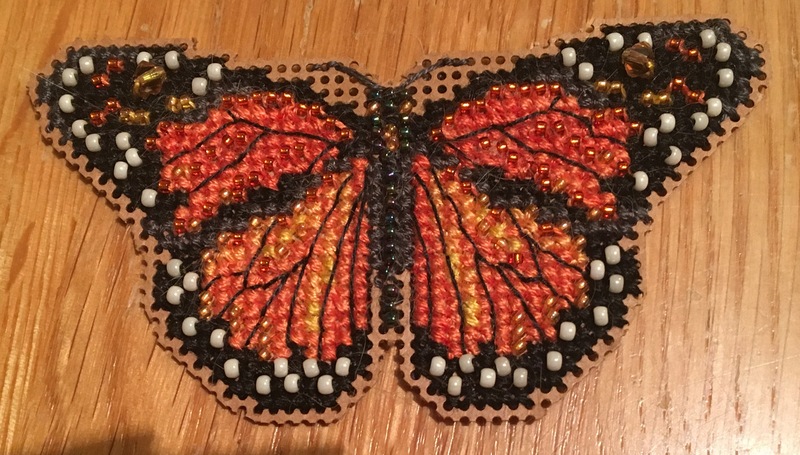 My last finish, the butterfly, was stitched in a car and hotel room. This is the busy season for expos with another really huge show this weekend. I haven’t decided whether I’ll take this with me this weekend for stitching in the evening or if I’ll take another small kit that fits in my purse. I ran out of 931 while stitching (my own fault) and my husband, who understands my goal-oriented nature, stopped at a Michaels while we were out of town to get a single skein so I could finish up the cross stitching. He is the best! It’s amazing what a person can accomplish when you don’t have to go to work! I took this before moving the Q snaps over to the right hand border to finish that. I love it! I hadn’t realized how BIG it is! I’ve moved the Qs and am working in the bottom border. I’ll do the eagle next, then remaining side borders and Pharoahs. This year maybe??? So over a year ago I was in Nashville and some friends took me to visit their LNS The Stitchin Post. I saw models of a set of 6 Mill Hill beaded stockings. Alas, they no longer had the kits stocked. A few months later I thought about them and did a web search and found them on Amazon! Two days later they arrived at my door step. I grabbed one as a travel project for a trip over Fourth of July weekend. 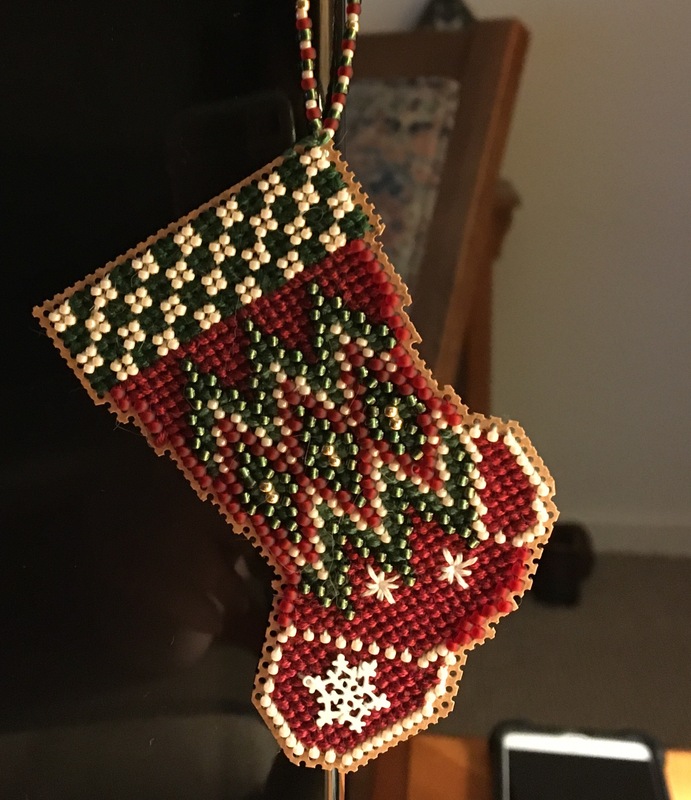 I finished the stitching during the trip and did the beading when I got home. It’s so cute! At some point I need to get some felt to add a backing to this as well as The Mittens! I did several years ago. 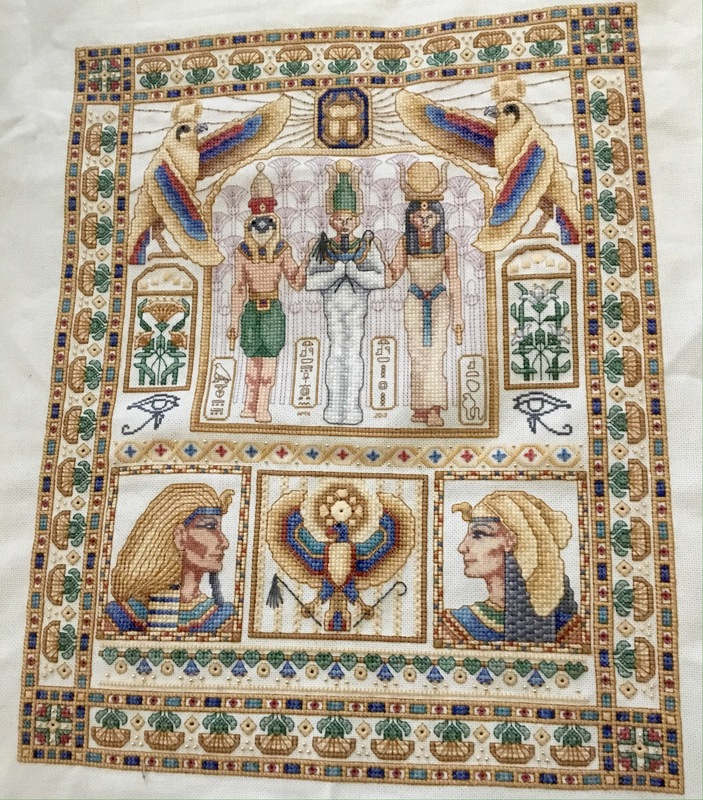 I’m committed to finishing my TW Egyptian Sampler this year so maybe working in the rest will be “easy” stitching after finishing the complexity (and dreaded back stitching) of a TW.